Dolly is more organized now than anytime during its lifecycle. The eye is getting smaller with an excellent representation on radar. It is now on the move moving northwest. It is good that it is so close to the coast with a landfall in another several hours - around very late morning or midday. With landfall, Dolly will stop intensifying. Pressure was measured at 972 mb by the recon several hours ago. This was a significant drop from the previous recon. We expect that the pressure is continuing to fall. Top winds are 85 mph and it's possible that Dolly will come in as a minimal cat 2 (96-100 mph). We are looking for the more westerly turn as the high builds to the north, but that may not occur until Dolly makes landfall. At this time landfall looks to be at South Padre Island, with that location receiving the worst of the storm tides in the next several hours. Keep in mind that there will be the continued threat of tornadoes in the bands that move across south Texas too. The last recon dropped down to 964 mb. Again, it's good that Dolly is coming in because it started to go into a rapid deepening phase. The eye is just offshore of Browsnville, TX and will make landfall soon. Brownsville has been reporting very heavy rain the past four hours and had a wind gust to 61 mph. Dolly is slowing its northwest speed some and appears to be ready to make the more westerly turn that we have been waiting for. South Padre Island will be taking the brunt of this hurricane over next several hours. We just checked out some of the network news coverage. Some anchor mentioned that you were looking at pictures from their "storm vehicle" that was driving around town. They then commented that <b>no one else was on the road</b> The reason is that it is dangerous to do so. Once again the media is leading the way with responsibility. Sorry about the rant, but the network news agencies many times do not make prudent decisions during a hurricane. They would rather get high ratings video and not be a good example to the public. The Weather Channel also just mentioned that it now looks like the hurricane was coming in at South Padre like we had forecasted earlier. Brownsville, TX now has a gust to 64 mph. The worst will miss them to the northeast. 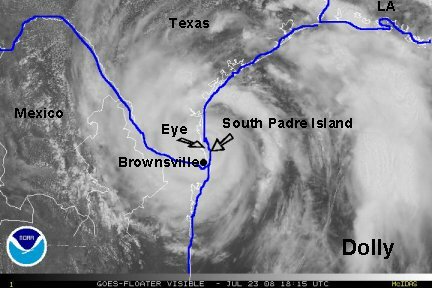 The southwest eye wall is stationary on extreme South Padre Island and no doubt is getting the worst of it. NHC in their last advisory has now noted that the northwest motion has stopped. Dolly has slowed and is turning more west. Heavy rainfall of more than 10 inches will end the drought that was eased a couple of weeks ago by thunderstorms. The drought farther north toward San Antonio will get significant help too. The help will come at the cost of isolated tornadoes, flash flooding along with South Padre getting a rough go of it. Since Dolly is making landfall it will now weaken and is already happening as noted by an increase in pressure from the last recon. Dolly will start to lose considerable strength by this evening as the center will be completely inland for several hours. Top sustained winds on the last advisory are at 95 mph. This is probably too high. 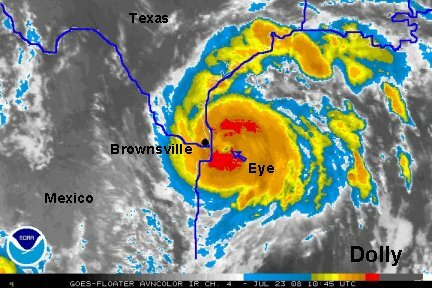 Some gusts may still be approaching 80-90 mph in the eye wall about 20-30 miles north of Brownsville. Some recent measured winds are 58 mph at Brownsville and 54 with a gust to 74 at Harlingen. Flash flooding with heavy rain as well as isolated tornadoes are the main concern from this point onward. Storm tide effects will be slowly be going down on the coast. Dolly was estimated to have top sustained winds at 85 mph on the last advisory. This is too high. 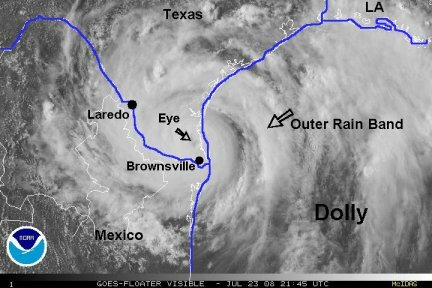 Our colleagues (as well as the hurricane center) may have had doubts if Dolly was actually a cat 2 hurricane at landfall. Still now, it is very doubtful that the winds are this strong. Gusts may still be in the 75-80 mph range. Top sustained winds are at the most 75 and probably 65-70 at this point. NHC should make Dolly a tropical storm on the next advisory. 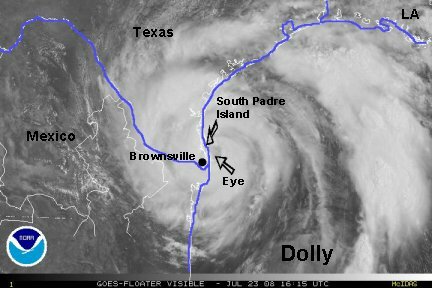 Extreme south Texas is getting soaked as the south edge of what was the eye of Dolly is almost stationary. 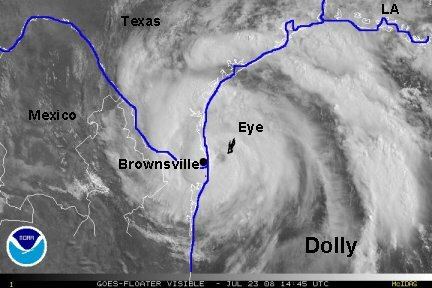 Brownsville broke their July record rainfall with the help of Dolly's rainfall. With the rain still coming down, the record will be totally smashed. Some areas of south Texas will probably get 10-15 inches. Rainfall and flash flooding is the primary concern at this point. NHC still has Dolly a hurricane on the last advisory at 75 mph. We're guessing it due to the 976 mb pressure reading. We doubt that the <i>sustained winds</i> are this high. Some gusts may still be this high. thre is o doubt at all that Dolly will be classified as a tropical storm on the 10 pm cdt advisory. Heavy rain rain with flash flooding concerns are still occuring in extreme south Texas and northern Mexico. Dolly is a tropical storm and will drop down to depression status sometime during Thursday. Winds are no longer much of a concern. The last advisory has taken the winds down to 60 mph, but as earlier we think this is still too high. It seems that NHC is forecasting for gusts instead of top sustained winds. The main problem now is with rain. The Doppler radar from Brownsville estimated 20+ inches in a small band from South Padre to inland about 20 miles. This may be a bit high, but still in the 15"+ range. On Thursday look for a threat of tornadoes across south Texas, especially with daytime heating being added. Also, flooding rains will still be a concern in northeastern Mexico with the circulation center and any squall bands from the Gulf of Mexico. Last edited by Caribbean Traveler on Thu Jul 24, 2008 9:24 am, edited 1 time in total. 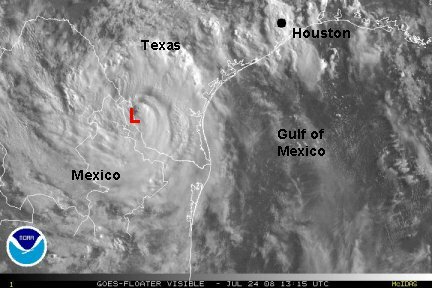 Dolly is continuing westward and is about to move into Mexico a few miles west of Laredo. A large area of solid rain continues southeast of Laredo. Other rain bands will form from Houston to San Antonio today. Right now a heavy band is moving to San Antonio and east of there. Flash flooding and the isolated tornado threat continues today for south Texas and into parts of central Texas. 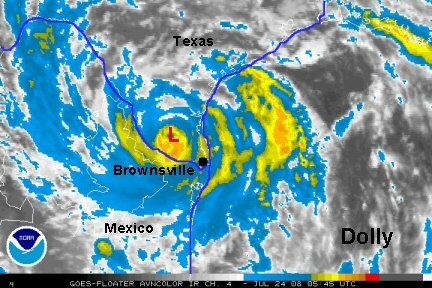 Dolly is a tropical depression west of Laredo in Mexico. Flash flooding will still be a concern in northen Mexico over the next 24-36 hours. It's possible that some of Dolly's moisture will reenter the U.S. into New Mexico as it flows around a mid level high. In our opinion, Dolly still was not a true category 2 hurricane. The top wind gust did not approach 100 mph, which <i><b>should</I></B> have been the sustained winds seen. A post season analysis may redesignate Dolly as a cat 1. This is the last update on Dolly.